Art Production Fund, New York, and the Nevada Museum of Art, Reno co-present Seven Magic Mountains, a large-scale public artwork using locally-sourced boulders and contractors, for a two-year installation in the desert outside of Las Vegas. Reno, Nev. – Art Production Fund and the Nevada Museum of Art are pleased to present renowned Swiss artist Ugo Rondinone’s colorful large-scale, public artwork for a two-year exhibition in the desert outside of Las Vegas. Scheduled to open in early 2016, Seven Magic Mountains will feature seven twenty-five to thirty-foot high day glow totems comprised of painted, locally-sourced boulders. The project has been nearly four years in the making and has included numerous Nevada partners. Visible across the desert landscape along Interstate 15, Seven Magic Mountains will offer a creative critique of the simulacra of destinations like Las Vegas. According to Rondinone, the location is physically and symbolically mid-way between the natural and the artificial: the natural is expressed by the mountain ranges, desert, and Jean Dry Lake backdrop, and the artificial is expressed by the highway and the constant flow of traffic between Los Angeles and Las Vegas. “Seven Magic Mountains elicits continuities and solidarities between human nature, artificial and natural, then and now,” Rondinone said. Rondinone has worked with Las Vegas Paving Corp. to source limestone boulders to construct the totems. Each of the boulders has been carefully selected by the artist according to size and shape. For Las Vegas Paving Corp., excavating massive boulders has been a deviation from “business as usual.” Typically, rock material sourced from the company’s quarries are crushed and used to build roads, highways, bridges and other large-scale industrial infrastructure. This is the first time the company has been enlisted to work on a public art project. “It has been a once-in-a-lifetime opportunity for me and my team to be part of such a monumental project,” said Ryan Mendenhall, division manager at Las Vegas Paving Corp. “Helping Seven Magic Mountains come to fruition has been a source of pride for the company.” Las Vegas Paving Corp. has been contracted to source the boulders, and to assist the artist with fabrication and installation. The company will also construct a graveled parking area adjacent to the exhibition site. At the conclusion of the project, Las Vegas Paving Corp. will remove all traces of the installation and parking area, returning the desert to its previous condition. MGM Resorts International championed Seven Magic Mountains from the beginning, signing its AAA Five Diamond property ARIA Resort & Casino on as exclusive hospitality sponsor in 2013. James J. Murren, Chairman and CEO of MGM Resorts International, immediately recognized the project’s implications for promoting awareness of both the visual arts and the natural and cultural heritage of the region. Upon conclusion of the two-year exhibition, MGM Resorts International will retain one of the totems for permanent display in The Park, the company’s new entertainment district that will lead to the world-class new arena being built on the Las Vegas Strip. Murren says it will be a welcome addition to MGM’s renowned art collection. The Nevada-based law firm of McDonald Carano Wilson, LLP has contributed significant in-kind legal services, providing guidance to the producers in navigating the complex regulatory framework for the project, and representing the producers in the development of the various agreements with the principal parties involved with the production. The firm has also encouraged political support from key Nevada legislators. Las Vegas-based Fairchild Consulting Group serves as project manager and is the primary interface with the Bureau of Land Management Las Vegas Field Office and Clark County. The applications, permits, environmental reports, and safety measures associated with the installation of a major artwork on public lands are extensive and critically important to the project’s success. The Seven Magic Mountains Las Vegas Committee is comprised of community leaders and arts advocates Denise Cashman, Robin Greenspun, Michele Quinn, Nicole Ruvo and Tarissa Tiberti. In addition to the Committee and ARIA Resort & Casino, local financial support has come from Diana Bennett, Katie O’Neill and Chris Gonya. The Las Vegas Convention and Visitors Authority and TravelNevada are official marketing partners. David B. Walker, Nevada Museum of Art executive director and CEO, believes that education and public programming provide a fundamental link to understanding monumental artworks created by renowned artists of our time. Art Production Fund co-founders Yvonne Force Villareal and Doreen Remen say multi-site programming coupled with the significance of Rondinone’s work underscores the benefit of public art to communities. 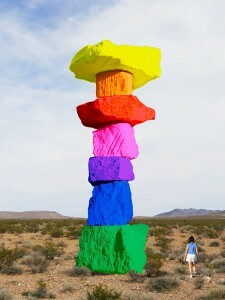 Seven Magic Mountains is produced by the Art Production Fund, New York and Nevada Museum of Art, Reno. It is scheduled to open by early 2016. Approximately 10 miles south of the intersection of Las Vegas Boulevard and St. Rose Parkway in Henderson, the installation site is a short distance from Jean Dry Lake where Michael Heizer and Jean Tinguely created legendary land art works in the 1960s. Many of the project’s public programs will take place at ARIA Resort & Casino, and our partner locations in Nevada, including the Marjorie Barrick Museum on the campus of the University of Nevada, Las Vegas. Born in 1964 in Brunnen, Switzerland, New York based Ugo Rondinone is a mixed-media artist whose works explore themes of fantasy and desire. Rondinone’s work is included in the following collections: The Museum of Modern Art, New York, the San Francisco Museum of Modern Art, San Francisco and the Institute of Contemporary Art, Boston, among others.